The Private or Alternative Stadium Financing and Cost Trigger Emergency Act of 2004 requires the Chief Financial Officer (CFO) to re-estimate the land acquisition, infrastructure and environmental costs of the proposed N Street site for the new baseball stadium. 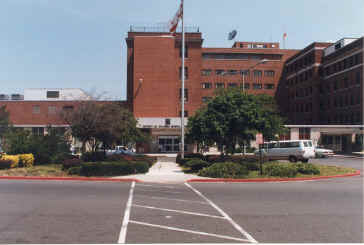 The site is bounded by N Street, SE, Potomac Avenue, SE, South Capitol Street, SE, and 1St Street, SE. In December 2004, the CFO estimated these costs at $115 million, but qualified that the estimate did not include costs for environmental remediation or relocation of existing owners: The legislation states that if the re-estimated costs exceed the CFO's original estimate by $50 million (for a total of $165 million) a new site for the stadium would have to be identified. As instructed by the Act, the Office of the Chief Financial Officer (OCFO) conducted a study to re-estimate the costs for land acquisition, environmental remediation, and infrastructure requirements. The study, based on data available through March 18, finds that the cost to the District to acquire roughly 13.8 acres of land, remediate the site, and provide Ballpark-related infrastructure improvements is approximately $161.4 million, including $11.9 million in contingency costs. Based on this finding, the site would be deemed "financially available" pursuant to the Ballpark Act. Quantifies water and sewer relocation costs. 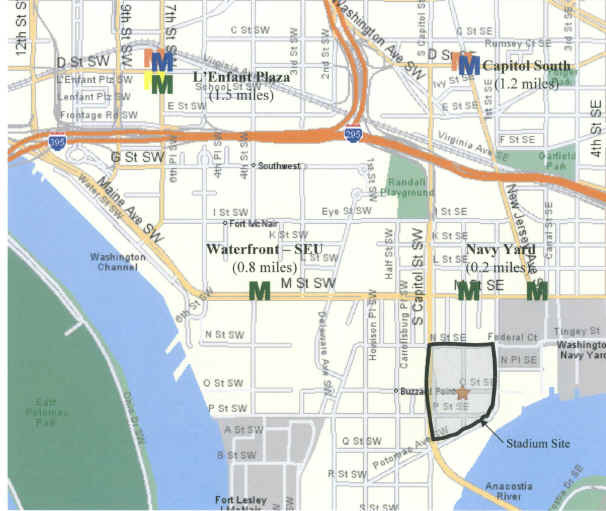 Since the Baseball Stadium Agreement defines infrastructure as the relocation of existing utilities and connection of new services, including water, storm, sewer, electric, and telephone, the CFO includes cost estimates from PEPCO, Verizon, and Comcast in addition to the Council's requirements. The following table summarizes the results of the cost re-estimation study. The proposed ballpark site consists of approximately 19 acres of land, of which the District already owns approximately 5 acres in roads and rights-of-way. The remaining 13.8 acres must be purchased from private landowners. The study identifies all of the privately owned squares and lots. These are assembled into economic units representing single or contiguous parcels with a single common owner. The economic units -are appraised at their highest and best use, adjusting for costs associated with demolishing existing structures and environmental remediation. The highest and best use takes recent zoning changes in the area into account. The study also includes estimates of the cost to relocate existing businesses and indirect expenses such as legal/condemnation costs related to use of eminent domain. "Just compensation" for property taken by the government in a condemnation proceeding is the full money equivalent of the property taken. Courts adopt market value as a rough equivalent of value to the owner. For condemnation purposes, just compensation will not take into account any increase in the value of the land due to the announcement of the public investment in the stadium. The District does not yet control the site and therefore invasive environmental testing could not be done. A Phase I Environmental Site Assessment was performed in accordance with American Society of Testing and Materials (ASTM) standards. The analysis identifies current and past uses of the property as well as "recognized environmental conditions" observed at the site. The study was conducted through record reviews, site reconnaissance, and interviews. The cost of environmental remediation is estimated at approximately $8 million. If environmental remediation costs increase, offsetting adjustments to property costs can be made. The infrastructure cost estimate relies on the cooperation of various agencies currently providing utility service and roadway access to the site, including DDOT, WASA, WMATA, PEPCO, Comcast, and Verizon. The estimated total cost of Ballpark-related infrastructure improvements is $76.2 million, which includes $11.9 million (or 16%) for unidentified contingencies. The estimate includes $29.4 million to relocate a twelve-foot sewer tunnel running under the stadium site. However, it may be possible to design the Ballpark so that the tunnel does not have to be moved. The cost to protect the tunnel in lieu of relocation is $2.3 million. The estimate also includes $19 million to upgrade the Navy Yard Metro station and an estimate of $10 million from PEPCO for the removal and relocation of existing electric utilities. The cost estimates are conservative. If a choice was made regarding a particular cost, the study includes the option encompassing the more robust scope of work. For example, the entire $29.4 million cost of moving the sewer tunnel is included. If the stadium can be designed around the tunnel, the new tunnel cost would be $2.3 million, which would reduce the total infrastructure cost to $49.1 million and bring the total estimated cost to $134.2 million. In addition, $19 million is included for the Metro station. It may be possible to provide the necessary improvements for substantially less. The study finds that the cost to the District to acquire roughly 13.8 acres of land, remediate the site, and provide Ballpark related infrastructure improvements is approximately $161.4 million, including $11.9 million in contingency costs. Based on this finding, the site would be deemed "financially available" pursuant to the Ballpark Act. * The Infrastructure cost estimate includes $29.4 million for the relocation of a twelve-foot sewer tunnel running under the stadium site. If the Ballpark is designed so that the tunnel does not need to be moved, the cost to protect the tunnel is approximately $2.3 million, reducing the total infrastructure cost to $49.1 million, and the total estimated cost to $134.2 million. Roadway Improvements -- This is typical for Potomac Avenues, N Street and 1st Street up to M Street: demolition & roadway excavation, new sidewalk, new curb & gutter, new street lighting, trees, striping, milling of existing pavement, 2" overlay, and new drainage.